The phrase “live-action Voltron movie” is one of those mythic internet movie stories. Every few years, it pops up, looks around, and goes back into its hole. Well, here’s its latest appearance. 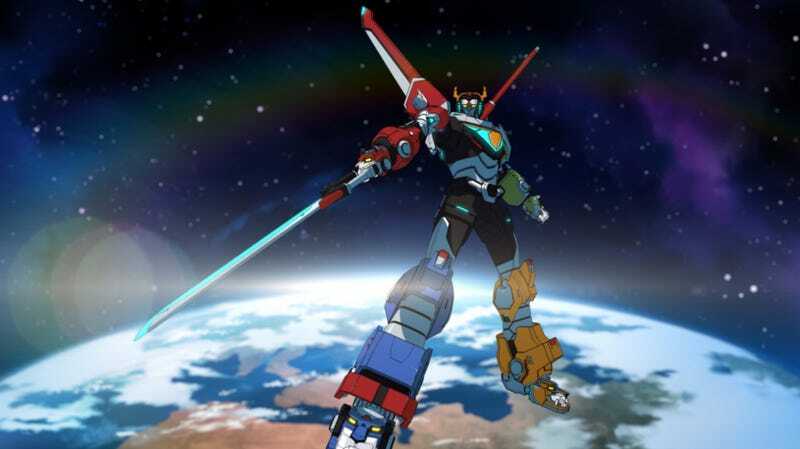 Deadline reports when Universal Pictures bought DreamWorks Animation for almost $4 billion earlier this year, one of the projects it inherited was an in-development, live-action Voltron movie. Why would that be part of a DreamWorks Animation deal? Because that’s the team behind Voltron: Legendary Defender on Netflix, which recently announced a second season. Well, turns out Universal is now considering the project, which either is being, or has already been, written by David Hayter, who wrote Bryan Singer’s X-Men and Zack Snyder’s Watchmen. Whether or not that means the movie gets made is unclear at this point. But it’s something that’s currently more alive than it was a few short months ago. Live-Action Voltron to Get the "Frank Miller Treatment"
Hollywood studios in bidding war to make big-budget Voltron movie?